Charles Jernigan saw a concert performance of Rossini's Zelmira in Washington on April 5. His review can be found here. Opera Rara have released their recording of Donizetti's L'Ange de Nisida, given its belated premiere last year, see here. Opera Rara are also recording Donizetti's Il Paria later this year. There will be a concert performance of the work at the Barbican, London. See here. There is an insight evening on April 30. See here. BBC Radio 3 broadcast Zajc's Nikola Subic Zrinski on April 11. See here. They broadcast Vaccai's Giulietta e Romeo on March 28, see here. These broadcasts are usually available for 30 days after first broadcast. Dynamic have released CDs (CDS7832.02), DVDs (37832) and Blueray (57832) of Vaccai's Giulietta e Romeo from the 44th Festival della Valle d'Itria, Martina Franca - July 2018. Newsletter 136 is now available. All the major Newsletter articles up to Newsletter 102 (October 2007) are now available online. Go to http://donizettisociety.com/newsletters.htm and then to the relevant link. 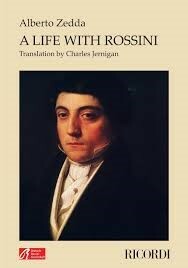 Ricordi have just published a book by Alberto Zedda called A Life with Rossini. It is in English having been translated by Charles Jernigan. The renowned conductor and musicologist, Alberto Zedda, was part of the group that founded the Rossini Opera Festival in Pesaro. His critical edition of The Barber of Seville was the first such edition for any Italian nineteenth century opera. Zedda, from Milan, began his career at the Cincinnati Conservatory, where he discovered that standard edition of The Barber was filled with mistakes, and thus he began his life-long love of Rossini and involvement in his operas. His book traces this involvement while ranging over an eclectic collection of Rossini related topics. A long review by Will Crutchfield can be found here. On 4 November 2017, Spyridon Xyndas’s comic opera, O Ypopsifios [The Parliamentary Candidate], was revived at the Municipal Theatre in Corfu, 150 years after its first performance. A DVD was made of the performance, which was a straightforward traditional production. The music is tuneful and original and in the style of contemporary Italian opera but with some more regional influences, which must have been uncommon at that time. A copy of the DVD may be obtained from the Corfu Philharmonic Society at a cost of 15 euros. Please email info@fek.gr. Excerpts can be found here from the start of the overture, here from the finale of Act 1 and here from the Final scene. The American Institute of Verdi Studies is a focus for Verdi activities in the US. Their Journal, The Verdi Forum, has many scholarly articles, all of which bar those from the most recent edition can be downloaded. The Loeb Music Library have started to digitise their 19th century score collection, see here.